As global publishers increasingly promote agile workflows both internally and externally, they rely more and more heavily on many individuals and smaller businesses to help get their massive, multi-million pound courses and products to market. These external suppliers (like emc) can provide any number of different services – from simple design of one component to full project management of entire courses. So how does emc fit into this process and how agile can we be? For the next three posts, we are going to begin to explore the different elements that can either help or severely hinder the ability to make publishers’ lives easier. We want this to be a dialogue so use the comments section to let us know if you have any comments, suggestions or anecdotes! 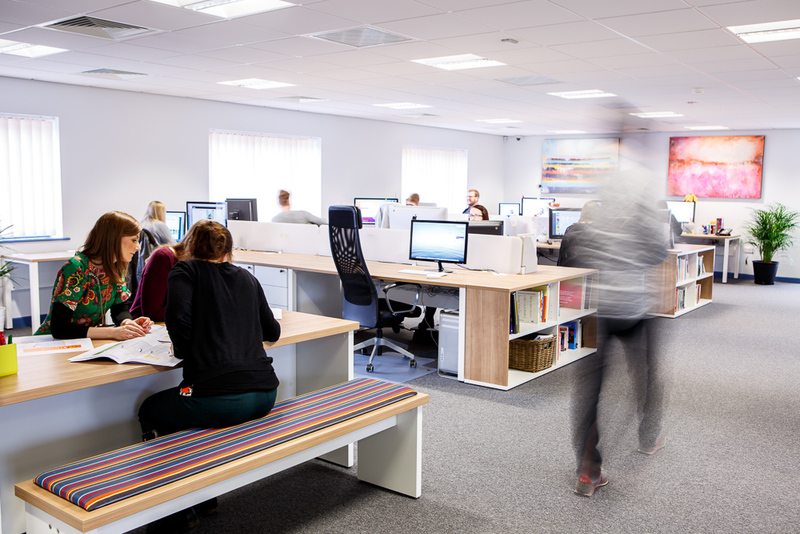 Here at emc, we are fortunate in that our current staffing levels have grown to put us in the top 2% of design agencies in the UK in terms of numbers of employees and resources. However, design in the UK in general is still very much a cottage industry (some of you might remember our barn? ), with the majority of design agencies having less than 12 members of staff. Regardless of size, suppliers like us become an integral part of the workflow – working as almost another branch of the publisher that hires them. As such, in an effort to provide better, more effective and efficient services, we also collaborate with small-scale suppliers, such as freelance editors, illustrators, and audio/video producers. All of these people are vital to the agile workflow of managing, delivering, and realising large-scale projects, and they are just as invested in bringing these projects to market quickly and profitably as their big-business clients. English courses tend to be huge, with multiple levels and components. For some courses, we’ve had more than five components over six levels, all coming in and going out in overlapping schedules. These components can be published to many different platforms – printed components such as student books and work books; additional teaching resources; online activity components, worksheets, interactive guides and materials; and fully immersive and interactive digital versions of all of the above, like apps and ebooks. Some courses include whole VLEs or LMSs that everything is framed in to give teachers and students everything in one place, which will include instructional material for teachers and Heads of Departments to help install and run the courses. Once published, these courses are sold all over the world, either in an international format or a format versioned for each specific market. This can include complete reversioning of both content and design depending on the market it’s going into. Regardless of the market, there has to be some kind of curriculum approval – either from a ministry or an exam board. These are learning materials, after all! The whole course must follow specific standards and be pedagogically sound. As you can see, publishing within ELT is a complex process. It’s also an extremely competitive industry which means each publisher needs their products to be brought to market more quickly than their competitors’ with more value added and at a higher quality – all for the right price! Although this provides choice and access to teachers and learners, giving them access to the most up-to-date materials on the latest platforms, it places a lot of pressure on every aspect of the publishing process, from editorial to production to sales, and from authors to designers to illustrators. Without agile systems in place (and sometimes even with them running at peak efficiency) condensing the timeframes of these large-scale projects can cause big problems. What happens when schedules get condensed? The project gets delayed as there is too much work for one or several parts of the supply chain to handle within the schedule. Even with our large capacity, our studio can be full! Quality dips as artistic and editorial integrity is compromised due to more people working on the job and the pressure to rush a job through to output. ROI across the board decreases as people work overtime or more people are added to the job, creating more need for internal quality control. As we mentioned above, our studio is particularly fortunate to have more resources than most to throw at a project if it comes in late or has a very tight turnaround. This allows for more flexibility on our end and gives our clients the confidence to place larger projects with us and give us more control over managing them. We know that in-house management time is at a premium, so design studios like us try to find solutions that help mitigate the amount of time in-house management must spend maintaining each job. The more we can do to assuage fears of dipping quality, the better! So placing courses with studios of emc’s size has some advantages, and we in turn have more capacity for ensuring our workflows are agile enough to meet our clients’ demands. Flexible resources – our company is structured so that we work in small individual teams to provide a unique approach to each job (even when competing courses are in the studio), but we are ultimately one large team, so we are able to share jobs throughout the studio when necessary depending on capacity and trust that each designer works to the exact same high standard. Quality assurance – not only do we have a team dedicated to in-house quality and consistency control, but each Design Manager is also given responsibility over specific projects, ensuring that they maintain design consistency throughout the life of the project. Expertise – we work hard to keep updated with the latest software and systems for design and project management, and we are keenly involved in the ELT world, which gives us a unique understanding of the industry and the ability to provide the right resources for our clients. At a recent Freelancer’s Away Day, one of the questions that kept coming up from the editors was how do you maintain editorial quality on materials when schedules continue to get tighter? No one within the supply chain is exempt from this concern when the majority of the stress is pinpointed on only a few key stakeholders – we see the integrity of jobs compromised on many levels when this happens, from manuscripts to illustration to design. The only thing to do is ensure workflows are as effective as possible and communication is constant and all-encompassing. Each member of the team, from the author to the printer, needs to be on their toes and ready for anything! So how do you deal with condensed schedules? What do you and your colleagues do to try and ensure the most effective, agile workflows possible? Next up in this series, we’ve asked Lyn Strutt, an experienced ELT editor, to take a look at what’s happening from an editorial point of view. And in the last post of the series, with your help, we’ll be looking more into the specific ways we can maintain an agile workflow to the benefit of everyone involved in the process. So join us – we’d love to hear from you about your own experiences in the comments section below!